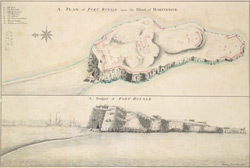 View of Fort Royal off the coast of the Caribbean island of Martinique. The history of the island is one of warfare and political upheaval. Discovered by Colombus in 1502, it was claimed by the French in 1635, officially annexed by the King of France in 1674 and then fought over by France and Britain for much of the 18th and early 19th centuries. It was finally restored to France by the Treaty of Paris in 1814. A key to the left clearly identifies the different parts of the fort such as the barracks, the magazine and the Governor’s house.